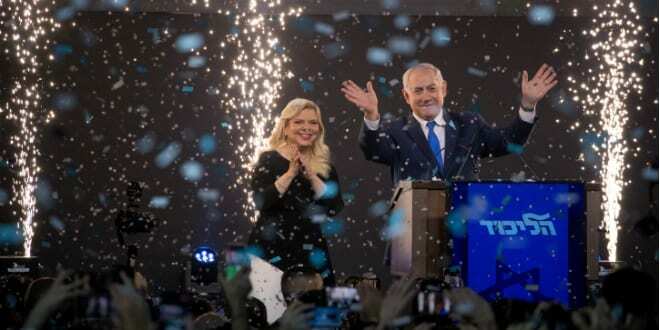 The Israeli elections ended Tuesday night with a tie: Likud under incumbent Benjamin “Bibi” Netanyahu receiving 35 mandates and Blue and White under Benjamin “Bennie” Gantz receiving an identical 35 mandates. Though both parties declared an election victory, it is clear that Israelis have once again chosen Netanyahu to lead. Likud had its best showing ever under Netanyahu, winning 26.27 percent of the vote. Blue and White, a new party formed by political alliances, won 25.94 percent of the vote. Only some 14,000 votes separated the two parties. Next week, President Reuven Rivlin will consult with the elected party leaders, chooses the Knesset member most likely to have the ability to form a viable coalition representing at least a 61 seat majority. While this typically is the leader of the party receiving the most seats, it is not required to be so. The leader of the party deemed the most likely to form a majority coalition has up to 42 days to negotiate with the different parties, and then present his or her government to the Knesset for a vote of confidence. If the Knesset approves the proposed government (by a vote of at least 61 members), he or she becomes Prime Minister. It is for this reason, Israel’s system of coalitions choosing the prime minister, that Netanyahu will most likely be Israel’s next leader. Based on the results, the right-wing bloc allying with the religious parties can form a coalition of 65 Knesset seats, while the left-wing bloc allied with the Arab parties wins only 55 seats. With Netanyahu at its head, the right-wing bloc will appoint Netanyahu prime minister. The New Right with 3.14 percent of the vote, Zehut with 2.53 percent, and Gesher with 1.75 percent did not pass the minimum 3.25 percent threshold to enter the Knesset..
𝑮𝒐𝒅 𝒊𝒔 𝒆𝒗𝒆𝒓𝒚𝒘𝒉𝒆𝒓𝒆, 𝒆𝒗𝒆𝒏 𝒊𝒏 𝒕𝒉𝒆 𝒏𝒆𝒘𝒔. 𝑻𝒉𝒂𝒕’𝒔 𝒘𝒉𝒚 𝒘𝒆 𝒗𝒊𝒆𝒘 𝒆𝒗𝒆𝒓𝒚 𝒏𝒆𝒘𝒔 𝒔𝒕𝒐𝒓𝒚 𝒕𝒉𝒓𝒐𝒖𝒈𝒉 𝒕𝒉𝒆 𝒍𝒆𝒏𝒔 𝒐𝒇 𝒇𝒂𝒊𝒕𝒉. 𝑾𝒆 𝒂𝒓𝒆 𝒄𝒐𝒎𝒎𝒊𝒕𝒕𝒆𝒅 𝒕𝒐 𝒅𝒆𝒍𝒊𝒗𝒆𝒓𝒊𝒏𝒈 𝒒𝒖𝒂𝒍𝒊𝒕𝒚 𝒊𝒏𝒅𝒆𝒑𝒆𝒏𝒅𝒆𝒏𝒕 𝑪𝒉𝒓𝒊𝒔𝒕𝒊𝒂𝒏 𝒋𝒐𝒖𝒓𝒏𝒂𝒍𝒊𝒔𝒎 𝒚𝒐𝒖 𝒄𝒂𝒏 𝒕𝒓𝒖𝒔𝒕. 𝑫𝒊𝒔𝒄𝒊𝒑𝒍𝒆𝒔 𝑶𝒇 𝑻𝒓𝒖𝒕𝒉 𝒑𝒓𝒐𝒗𝒊𝒅𝒆𝒔 𝒖𝒑-𝒕𝒐-𝒅𝒂𝒕𝒆 𝒏𝒆𝒘𝒔 𝒂𝒏𝒅 𝒊𝒏𝒇𝒐𝒓𝒎𝒂𝒕𝒊𝒐𝒏 𝒂𝒇𝒇𝒆𝒄𝒕𝒊𝒏𝒈 𝒕𝒉𝒆 𝒃𝒐𝒅𝒚 𝒐𝒇 𝑪𝒉𝒓𝒊𝒔𝒕 𝒘𝒐𝒓𝒍𝒅𝒘𝒊𝒅𝒆 𝒇𝒓𝒐𝒎 𝒂𝒏 𝒖𝒏𝒄𝒐𝒎𝒑𝒓𝒐𝒎𝒊𝒔𝒊𝒏𝒈 𝑩𝒊𝒃𝒍𝒊𝒄𝒂𝒍 𝒘𝒐𝒓𝒍𝒅𝒗𝒊𝒆𝒘. 𝑶𝒖𝒓 𝒐𝒃𝒋𝒆𝒄𝒕𝒊𝒗𝒆 𝒊𝒔 𝒕𝒐 𝒑𝒓𝒆𝒔𝒆𝒏𝒕 𝒕𝒉𝒆 𝒏𝒆𝒘𝒔 𝒘𝒊𝒕𝒉 𝒕𝒉𝒆 𝒘𝒐𝒓𝒅 𝒐𝒇 𝑮𝒐𝒅 𝒂𝒔 𝒐𝒖𝒓 𝒍𝒆𝒏𝒔, 𝒂𝒏𝒅 𝒕𝒐 𝒃𝒓𝒊𝒏𝒈 𝒕𝒐 𝒍𝒊𝒈𝒉𝒕 𝒘𝒉𝒂𝒕 𝒊𝒔 𝒉𝒊𝒅 𝒊𝒏 𝒕𝒉𝒆 𝒅𝒂𝒓𝒌𝒏𝒆𝒔𝒔. 𝑾𝒆 𝒂𝒓𝒆 𝒂 𝒏𝒐𝒏-𝒑𝒓𝒐𝒇𝒊𝒕 𝒐𝒓𝒈𝒂𝒏𝒊𝒔𝒂𝒕𝒊𝒐𝒏.